HARLEM — Qasem Al-Rousan invested his life's savings into the deli he opened at Park Avenue and 116th Street in East Harlem 18 months ago. But damage to the store from the March 12 gas explosion that leveled two buildings and killed eight people means his landlord thinks the space will be out of commission until next year. Al-Rousan applied for a loan from the U.S. Small Business Administration that may not be enough to keep his business afloat. "I'm just borrowing money from friends to get by," said Al-Rousan. "How can I open another store when I can't even pay the rent for the apartment I live in for the last two months?" It's situations like Al-Rousan's that have led Assemblyman Robert Rodriguez to ask Gov. Andrew Cuomo to set up a small business recovery fund of up to $500,000 that could give grants or forgivable loans of $5,000 to $30,000 to help businesses still struggling in the explosion's aftermath. "State intervention and assistance in support of these businesses is a priority," Rodriguez wrote in the May 8 letter. "I am asking your office to consider creating a small business recovery fund that would assist these businesses to get back on their feet. As we saw from the state efforts undertaken in response to Superstorm Sandy, lifting up small businesses in the aftermath of a disaster is critical." According to the city's department of Small Business Services, 60 ground-level businesses were affected by the explosion. Two were completely destroyed, six suffered heavy damage, 15 had moderate damage and another 37 were affected by the street closings required to recover the bodies of victims, clear the debris and allow the National Transportation Safety Board to investigate. Con Edison offered grants of between $2,000 and $2,500 to businesses depending on the level of physical damage. As of May, 90 percent of the affected businesses have reopened. Five remain closed and one is offering limited service. The U.S. Small Business Administration is offering home, business, nonprofit and economic injury loans at rates ranging from 2.25 percent to 4 percent. The deadline to apply is June 9. 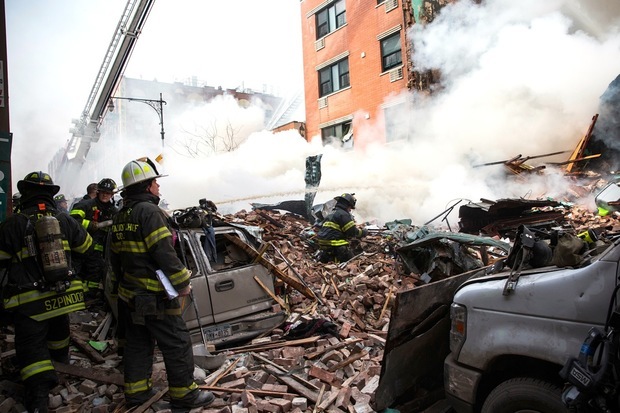 But some East Harlem businesses affected by the explosion at 1644 and 1646 Park Ave. can't take advantage of loans offered by the U.S. Small Business Administration because they don't meet credit and collateral requirements, Rodriguez said. Other business owners have already taken out loans to launch or expand their businesses and are wary of going further into debt. "Many of the property owners have insurance. The businesses leasing from them may not," said Rodriguez. "These businesses need to start getting back to business now." Even businesses that have managed to reopen are struggling. Domingo Fernandez's Midtown Fish & Meat Market, just around the corner from the explosion on 116th Street between Park Avenue and Madison Avenue, was closed for 26 days after the blast when the generators for his refrigeration system were damaged and the windows blown out. Fernandez had to invest $40,000 of his savings to repair the generators, add new glass and replace $13,000 worth of meat. He couldn't accept EBT or credit cards for a while after re-opening because communication lines in the area were down. "It's not the same as before. I lost customers because I closed for 26 days," said Fernandez, who added that a $13,000 low-interest loan was helpful but does not cover his losses. The governor's office did not immediately respond to requests for comment regarding Rodriguez's letter but the assemblyman said he remains optimistic and has spoken with Cuomo's top aide, Larry Schwartz, secretary to the governor, and the Empire State Development Corporation about the need to support small businesses in the area. After meeting with state officials, Rodriguez believes there is a precedent for this sort of aid because of assistance provided after previous disasters such as Hurricane Sandy. Local groups such as the Harlem Community Development Corporation could be tapped to administer the money, he said. "These business owners have families to support and their businesses were the principal way they did that," Rodriguez said.